The Tall Mama: I Made It Monday - Another Midi & Great Fabric Find! I Made It Monday - Another Midi & Great Fabric Find! I made a centre back zip in this skirt with 2 box pleats. I was rushing to finish the skirt to wear to a baby shower. I really should have named this blog "The Tall Mama & Her Midi" because I love them & hope you do too! 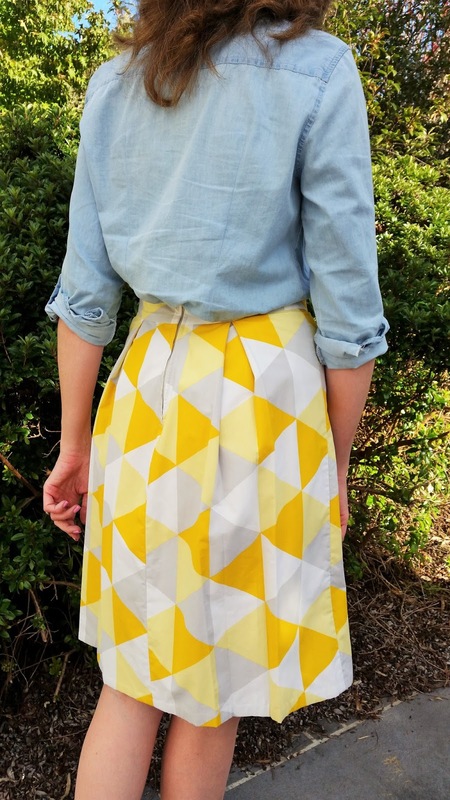 This midi skirt is made from my basic midi pattern with 2 box pleats in the front and back (see tutorial here). I often get asked where I find my fabrics. I buy most of my fabric from The Remnant Warehouse; I'm in no way affiliated with them (but would love to be - I'd make you proud The Remnant Warehouse!!). I love their selection, quality and most importantly price! Check them out online. I am also lucky enough to be gifted fabric from people who know I sew and have a love & appreciation of vintage fabric (examples here and here). However you don't have to limit yourself to fabric stores when looking for fabric, inspiration can strike anywhere! This gorgeous yellow & grey geometric fabric started its life as a doona (duvet) cover at Target! Yep, I saw this in the bedding section and thought "why can't I find fabric like that for a midi skirt?". Duh! It is fabric and I can turn it into a skirt with plenty to spare! So the moral of the story is: when shopping for fabric don't limit yourself to fabric stores or feel discouraged if you don't have good fabric stores in your area. Keep an open mind and great fabrics can be found anywhere! That is a beautiful skirt! I really like the chambray with it too. 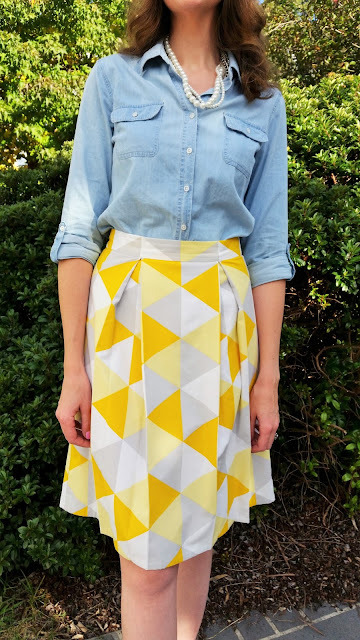 I have been obsessed with midi skirts lately too and love this one you created!! That midi skirt is amazing! I love the print and can't believe you made it! Thanks so much for being a part of Fun Fashion Friday & we'd love to have you back next week!